The purpose of the above article is to discuss musical geniuses who were devoted to homeopathy as a mode of healing. For more scientific evidence for homeopathy, visit my other blogs. Sir Yehudi Menuhin (1916-1999) was a Jewish American-born violinist, violist, and conductor who spent most of his adult life in the United Kingdom. He began playing the violin at age three, and his first public performance, with the San Francisco Symphony, occurred when he was only seven. During World War II, he performed more than 500 concerts for the Armed Forces, which earned him the French Legion of Honor and Croix de Lorraine, the Belgium Order of the Crown and Order of Leopold, the Order of Merit from West Germany, and the Order of the Phoenix from Greece. He also received more than fifty additional honors, including an honorary knighthood from Queen Elizabeth II (England's highest honor for a non-British subject). Due to ailments he experienced from the strain of performing and traveling, he began practicing yoga and meditation and using homeopathic medicines. He became the honorary president of the Hahnemann Society, a leading British homeopathic organization. More publicly, he asserted with great succinctness: "Homeopathy is one of the rare medical approaches which carries no penalties--only benefits." Sir Yehudi further acknowledged that homeopathy's survival has not been easy as it has had to "withstand the assaults of established medical practice for over 100 years" (Kindred Spirits, 1989). Dizzy Gillespie (1917-1993) was an American jazz trumpeter, bandleader, singer, and composer. Along with Charlie Parker, Gillespie was a major figure in the development of bebop and modern jazz, and played a major role in defining Afro-Cuban jazz. After being introduced to homeopathic medicine by his protégé, Jon Faddis, Dizzy had such remarkable experiences that he once told Faddis: "I've had two revelations in my life. The first was bebop; the second was homeopathy." Ravi Shankar (1920-) is a Bengali-Indian master musician of the sitar. He played a seminal role in the introduction of classical Indian music to Western culture. Ravi Shankar was another appreciator of homeopathy who not only sought homeopathic treatment wherever he lived but also on the road doing concerts. One Boston homeopath who treated him after a concert remarked how open he was with all around him about his strong preference for homeopathic treatment over all other forms of medicine. Tina Turner (1939-), often called the queen of rock & roll, is an American pop, rock, and soul singer who has won seven Grammies. She has a star on the Hollywood Walk of Fame and was inducted into the Rock & Roll Hall of Fame. It is hard to imagine, but during the early 1970s this powerful woman was literally brought to her knees by a diagnosis of tuberculosis. She initially sought conventional medical treatment, but continued to suffer, until she sought care from Chandra Sharma, MD, a homeopathic doctor in England. Tina considered him her doctor and her friend. He passed away in 1986, and she wrote in her autobiography: "I miss him more than I can say." Tina also noted: "Fortunately, his son, Rajandra, was his protege and is carrying on his work" (Turner, 1986, 156). In 1985, Vogue magazine reported on Tina's longtime interest in homeopathy and Buddhism: "Tina Turner looks about thirty-six, and her skin is flawless. She does not deprive herself. She sips wine at dinner, does not diet, does not take vitamins. If she's feeling particularly stressed, she consults a homeopathic doctor" (Orth, 1985). In her autobiography, she wrote: "Life in the fast lane wore me down, changes in my diet and homeopathy saved me. Thanks to my Homeopathic physician, for bringing me back to health and always being available for me" (Turner, 1986). Paul McCartney (1942-), formally known as Sir James Paul McCartney, MBE, is best known as a member of the Beatles, and later, as leader of Wings. He is a British singer, musician, and songwriter who the Guiness Book of World Records lists as the most successful composer in popular music history. He has written or co-written more than fifty top-ten hits, and innumerable other music artists and orchestras have recorded his songs. Paul's first wife, Linda Eastman (1941-1998), introduced her husband to vegetarianism in 1975, and she authored several best-selling vegetarian cookbooks. In a 1992 interview, Linda McCartney asserted: "We never go anywhere without our homeopathic remedies. We often make use of them--and that goes for Paul too" (Glew, 1992). Linda's interest in homeopathy began when a friend broke her arm, and Linda was duly impressed at how fast the injury healed with homeopathic treatment. But it wasn't until she had her own case of tonsillitis that she actually tried homeopathy herself. She was prescribed a round of antibiotics that worked but only temporarily. She then went to a homeopathic doctor. Not only did her symptoms go away rapidly, they never returned. She said, "We couldn't cope without homeopathy." Sadly, Linda McCartney died in 1998 due to breast cancer. Roger Daltrey (1944- ) is the lead singer for The Who. In May, 2008, Daltrey revealed to the Times of London that homeopathic medicine saved his infant son (Naith, 2008). Daltrey revealed, "I had a very, very dramatic experience with my son when he was nine months old. He had gastro difficulties, started throwing up, could not keep any food down and turned into skin and bone. At the hospital, they did every test to him, and in the end they just handed him back to me. My wife and I were in bits. My poor baby. The kid was dying. It was terrifying. I thought, there's got to be something. I'd heard of homeopathy, so I found a local guy in the Yellow Pages and took my boy there. He gave him some powders. Within two weeks he was putting weight on, keeping the food down. The trouble recurred periodically for a couple of years, but he's now 27, a fit and healthy young man." Daltrey further explained that he has seen other miraculous results from homeopathic treatment, "The bizarre thing is that I've got a chiropractor friend in LA whose baby landed up in exactly the same state. He thought he was about to lose him. But I recommended homoeopathic remedies, and he recovered too. That's God's honest truth. Now I bet doctors would say, 'Oh they'd have got better anyway'. But I can't believe that." Pete Townshend (1945-) is an influential English rock guitarist and songwriter who is best known as guitarist for The Who. Townshend has authored more than 100 songs, and the rock opera Tommy. Townshend suffers from partial deafness and tinnitus due to exposure to loud music during concerts and through the use of headphones. His condition is attributed in part to an infamous 1967 television appearance during which fellow Who musician, Keith Moon, set off a large amount of explosives inside his drums while Townshend was standing in front of them. In 2000, Pete told a magazine reporter: "I've had some treatment for it. I found a homeopathic practitioner who has really helped reduce it tremendously" (Wilkerson, 2006, Chapter 18, note six). Cher (1946-) is a total entertainer and has won a Grammy (1999), an Oscar (1989), three Golden Globe awards (1974, 1984, and 1989), and an Emmy (2003). In 1987 Cher was struck by a debilitating viral illness that manifested in chronic fatigue and bouts of pneumonia. She was disabled from working for two years: "I tried regular medicine and it just didn't work. Doctors said any illness was all in my head. People thought I was crazy." Then she decided to do something different: "I turned to a Sikh homeopathic doctor, almost in desperation. He started doing homeopathic stuff with herbs and vitamin therapy. Many doctors didn't believe in all that back then. Within four months, he'd got me up and back on the road again." In addition to seeking care from this unnamed Sikh doctor, Cher sought treatment from a French homeopathic doctor, Dr. Marcel Dinnet. According to famed gossip columnist Liz Smith, Dr. Dinnet is reported to have 10,000 devoted patients in Los Angeles, including Sarah Ferguson (the Duchess of York) and Elizabeth Taylor (Smith, 1988). Cher pledged her support for the Glasgow Homeopathic Hospital after seeing a TV news report that the government was slashing the city's health budget by 58 million pounds (around $100 million). She intended her donation of $24,000 to encourage others to pledge cash to help keep the hospital open. The hospital treats 500 in-patients a year. The hospital's staff and patients have sharply criticized the budget reduction for both medical and economic reasons. They asserted that closing this important natural medicine hospital could lead to higher health care costs for the Greater Glasgow Health Board. Cher further asserted: "I'm not quite sure exactly what that will mean but I'd be prepared to do anything I can to help." (Sloan, 2004). Albrecht, T. Letters to Beethoven and Other Correspondence. Vol. 3: 1824-1828. Lincoln: University of Nebraska, 1996. Beethoven, L. van. Briefwechsel Gesamtausgabe, Band 6, 1825-1827. Munchen: G. Henle, 1996. Beethoven, L. van. Ludwig van Beethovens Konversationshefte, Band 8, Heft 91-103. Leipzig: VEB Deutscher four Musik, 1981. Collins, S. The man who wants to make Tina Turner live until she's 120, Sunday Mirror, November 7, 1999. Glew, J. "We couldn't cope without homeopathy," Health and Homoeopathy, Summer 1992, 6-7. Hayden, D. Pox: Genius, Madness, and the Mysteries of Syphilis. New York: Basic Books, 2003. Hellenbroich, A. In Celebration of Ludwig van Beethoven's 225th Birthday, Fidelio, Winter 1995. Kindred Spirits, Daily Telegraph, August 12, 1989. Mai, F. Diagnosing Genius: The Life and Death of Beethoven. Montreal: McGill-Queen's University, 2007. Maretzki, T. W., and Seidler, E. Biomedicine and naturopathic healing in West Germany: a historical and ethnomedical view of a stormy relationship. Culture, Medicine and Psychiatry, December 1985, 9,4:383-421. Orth, M. Tina, Vogue, May 1985, p. 318. Schweisheimer, W. Beethoven's Physicians, Musical Quarter, 1945, 31:289-298. Sloan, B. Cher's Ward Rage: Exclusive Star's Fury Over Bid to Close Scots Homeopathic Hospital, Sunday Mail, May 16, 2004. Turner, T. I, Tina. New York: Avon, 1986. 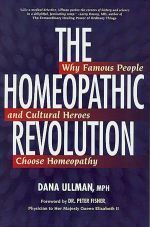 Ullman, D. The Homeopathic Revolution: Why Famous People and Cultural Heroes Choose Homeopathy. Berkeley: North Atlantic, 2007. Ullman, D. The Curious Case of Charles Darwin and Homeopathy. Evid Based Complement Alternat Med. 2009 Oct 29. Wagner, R. My Life, Volume I. New York: Dodd, Mead and Company, 1911. Watson, D. Richard Wagner: A Biography. New York: McGraw Hill, 1979.